Did you know that you can prepare for exams and take practice tests online through WCCLS? We offer access to a product called LearningExpress. Use it to prepare for many education-related exams like the SAT, ACT, AP, and GED. Looking at taking a career-related exam? 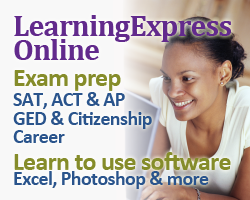 LearningExpress can help you prepare for the ASVAB exams, CDL, plus much more. Have a career you're happy in, but need to learn more about a particular software program? Check to see if LearningExpress offers tutorials for it. Bone up on Excel, Photoshop, and more! Know someone who needs some computer basics? LearningExpress also covers Windows and Macintosh basics. If you're looking at making some career or educational changes, check to see if LearningExpress offers resources to help make your learning journey a little smoother!